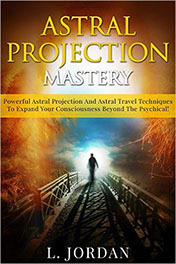 Today I'm reviewing the book Astral Projection Mastery by L. Jordan. The website astralism.com lists this book as #3 of "The 3 Best Astral Projection Books On The Market." (#1 was Erin Pavlina's Astral Projection Guidebook and #2 was Robert Bruce's Astral Dynamics) So does it live up to their claim? The book is a decent size, with decent font and small margins, but it's only 89 pages, so kind of small. The information is solid, for the most part. The biggest problem I had is that the book was difficult to read. I've read many books in my lifetime, but this one was just cumbersome for me, and I couldn't quite tell why. I can't accuse it of being immature, or having poor grammar, spelling or structure, but for some strange reason, I found myself having to re-read every sentence two or three times to make sure I understood the meaning. Part of the problem is that the author often used unexpected words. Like "on the world" when my brain expected "in the world." He often wrote about astral projection as if it's a noun rather than a verb. For example, he'd write "when you're having your astral projection" like the British "when you're having your tea." My brain expects something different, say, "When you're astral projecting" or some such. Maybe the author is British, so the sentence structure was not what my brain expected. I'd literally read a sentence, then my brain would go, WTF did that just say? I'd re-read the sentence and say, Oh. Right. Got it. Then I'd look at the sentence again and wonder, "Why did that sentence trip me up?" Beats me; it makes perfect sense the second time through. I felt this way about literally every sentence in the entire book. So it's accurate to say I read this book twice; I just did it a sentence at a time! Several of my colleagues at work are British, so I'm well versed in British colloquialisms and phrases, like "In due course," "straight away," "there we go." So it's not that. I've read some very fine books by British authors, such as Graham Nicholls, and never had this problem before. So I'm not quite sure why I struggled. "Going for an astral travel." A few times is charming, but Jordan does it way too often. By the way, I disagree. In a dream, you're unconscious. In astral projection, you are conscious (which the author later admits). But no, it doesn't feel much like a dream to me. It doesn't feel like a lucid dream either. In a lucid dream, you're conscious, but the scenery is often more vivid, realistic, vibrant, colorful, and seems more solid, like a vivid, detailed dream. In an OBE, the scenery is often heady, foggy, trippy, or otherworldly. But Jordan doesn't give much explanation to justify his views. After a few chapters I found myself imagining a man with a thick British accent reading it aloud, and it flowed a little better in my mind. (I don't know if L. Jordan is a man or woman. I imagined a man's voice simply because my British co-workers are all men, so that's what I'm used to hearing.) However, I also noticed that the author used American spellings. For example, "color" instead of the British spelling, "colour." Go figure. The book has no OBE narratives, and I don't like that either. You don't get any sense of the author's experiences or credentials. Like so many average OBE books out there, Jordan just gives you information about astral projection and you're expected to accept it at face value. These techniques are not short-changed, but they're also not explained as well as the original authors. "Make your body boring and your astral body beautiful. To me, it seems like time passes pretty much normally, with a few exceptions. The grammar and spelling aren't bad, but like I said, the writing seemed cumbersome and hard to read. This is not a bad book, but my personal opinion is that there are a lot better books out there. It's certainly a lot better than my previous book review, but still not in my Top Ten OBE Books, let alone the top 3. I don't know what the reviewers at astralism.com were smoking when they listed it in the top three. In my opinion, it's not even close. I'll give it 3 stars. Thanks for your review, Bob. As a British person I can confirm that quotes like "Going for an astral travel" and "No single human being has the onus of dishing out the outstanding energies that traverse your different planes, both physical and celestial" sound just as confusing and clumsy to me as they do to you. To me, many of the quotes sounded like they'd been written by someone who didn't speak English as their first language.